I believe that the above pictured plant is the one that Green and Kloppenburg attempted to publish as Hoya paulshirleyi in this issue. Their attempt was not successful. You’ve seen this picture before in a previous issue. Since this publication uses no paper, I thought it would help to show it again at the place where it is being discussed. The table of contents sits on a full page all by itself but it would fit on one quarter of the page. Most of the page is blank. Space is money. Blank space is money down the drain. Paper is made from trees. Trees take many years to grow large enough to provide shade or to be cut down to make more paper. Trees also help purify the oxygen we breathe. They are necessary to sustain life. The more you cut down, the less healthy is our planet. Please, IHA members, make this lady’s life a living hell until she starts conserving paper. Save our trees; save your money and most of all, save your life! The title of this page is Our Cover Story! As I continually harp, “A story is fiction.” You don’t pay dues to read stories; you pay for FACTS! When are they going to start printing facts? Error 1: This is Wayman’s introduction to the two authors’ attempted publication of the name Hoya paulshirleyi. It needs no introduction. It speaks for itself. Fact: I have seen and examined hundreds of herbarium specimens and I never saw a single one that was on a piece of square cardboard or a square anything else. The only mounted specimens I’ve seen are mounted on about 11 by 17 inch (a few slightly larger but proportionately the same) acid-free Bristol Boards or something similar (stiff but flexible and not heavy). Not all herbarium specimens are mounted. Some are preserved in alcohol. Fact 3). Herbarium specimens dating from the late 1800s are relatively new. At least three herbaria I know about have specimens dating from the mid-1700s. All I know about have specimens dating from the early and mid-1800s. 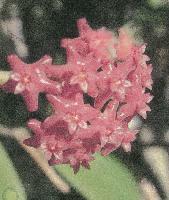 Asclepias carnosa L. f. (which is the type of Hoya carnosa (L. f.) R. Br.) dates from approximately 1791. One would expect an editor of a bulletin of this type would know that. 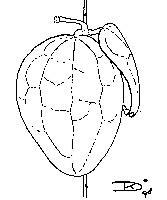 Error 4 & 5: She said that Hoya tomataensis is similar in appearance to this species, which she says is GPS-8844. Fact: IPPS/GPS-8844 is Hoya dolichosparte Schltr. It doesn’t even have the same coloured flowers as those pictured in Fraterna. I believe that the hoya on the cover may be IPPS/GPS-8845. If it is, then the picture shown on the cover is of flowers that are either partially open or partially closed. Fully opened, the corolla lobes of IPPS/GPS-8845 are reflexed or nearly so. As for being similar in appearance to Hoya tomataensis, they both have pink flowers but their foliage is entirely different (See pictures below). Fact: The numbered species in herbaria are not always given names. Many are still unidentified. Fact: I haven’t counted but it seems to me that Dale has published even more species that he found on old herbarium specimens. I believe that he assumes that just because a specimen is unidentified that it is also unpublished. I believe that a lot of his species will be sunk as soon as someone with better observational skills than Kloppenburg becomes interested in hoyas and does a bit of fundamental research. Let us pray that it is someone with a high I. Q. and an abundance of common sense. These pages contain the actual description of this questionably “new” species. I think it irresponsibly wasteful to use 4 pages (6 counting the cover and Wayman’s needless “story” about it on page 4). It would have, with a little planning, fit on 2 pages. Illustrating with two pictures of a single pollinarium (both pictures identical, except one picture is twice larger than the other) was needless and costly. Each of these two pictures occupy a full half page. That’s a full page for something that measures only about 1 cm. long by about a half cm. wide. This is especially wasteful if you factor in the fact that the pollinarium pictured does not belong to this species (if it is IPPS-8845 as I suspect). It is extremely wasteful too, to list every single one of the measurements of every minute flower part on a separate line and all of this double spaced. You are paying for that! For Pete’s sake, COMPLAIN! Error 1: THIS PUBLICATION OF HOYA PAULSHIRLEYI IS NOT VALID. It is entirely in English. The Code dictates that name publications be written in Latin. There isn’t a single word of Latin anywhere in it. There is no reference here to a previous publication of this name and a search at IPNI indicated that there has been no previous publication of this name. Unless IPNI is not up to date, I assume there is none. I also checked with Dr. David Goyder at Kew. He told me that he had not heard of a previous publication of this name either. If Mr. Kloppenburg and Mr. Green want to make this name stick, they need to get busy and publish it with a few descriptive Latin words at the beginning. They need also to cite a specimen number that matches the material on their holotype sheet. Before they attempt to publish it again, I suggest that they take another look at the pollinaria. The one pictured does not belong to the flowers pictured, if they are IPPS-8845 flowers. They need to cite a CORRECT holotype number (preferably with the collector’s name attached) and also say where the holotype specimen is housed. These were lacking in this publication. Error 2: The authors say that this is named for the collector, Paul Shirley. Yesterday I wrote of this, “They may be right but I suspect that they are not.” Today, I did a bit of research and discovered that I was 100% correct in doubting the accuracy of Kloppenburg and Green’s publication. First, I checked Paul Shirley’s catalog. I found that he listed (and pictured) GPS-8844 as Hoya dolichosparte Schltr., yet Kloppenburg and Green would have us believe that GPS- 8844 is a new species named Hoya paulshirleyi. Paul Shirley also said that Green and Kloppenburg had named GPS-8845 for him. He did not say who collected them but I was under the impression, from what I’ve read in other publications that those IPPS numbers, sold by Paul Shirley as GPS numbers were collected by Ruurd van Donkelaar. I know that the IPPS-8845 appeared in at least 2 publications that I read a few years before GPS-8845 appeared in Paul Shirley’s on line catalog. Error 3: The herbarium where the holotype specimen is housed was not noted, as it must be in a valid name publication. Error 4: The measurements of the leaves of this new species, match those of IPPS-8844, which are considerably larger than those of IPPS-8845. Left: Kleijn and van Donkelaar’s sketch of IPPS-8845 foliage. Center: Kleijn & van Donkelaar’s sketch of Hoya dolichosparte foliage (IPPS/GPS-8844 & 8831). 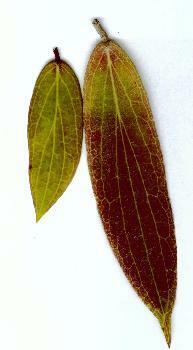 Right: A typical leaf of Hoya tomataensis. Left: Flowers of IPPS/GPS-8845. Photo is Jacqui Langford’s. Right: Flowers of Hoya dolichosparte (IPPS/GPS-8844). Photo is Paul Shirley’s. 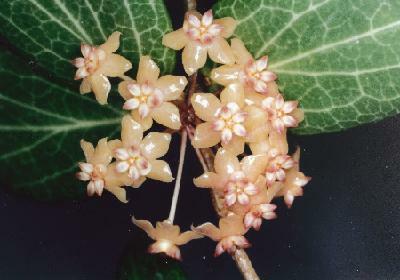 Above: Flowers of Hoya tomataensis. Photo is Mr. Green’s. Copyright law allows one to use portions of others’ work for illustration in educational works, as long as credit is given. I consider this an educational work. I think it strange that a man (Kloppenburg) who has repeatedly claimed that one can identify a hoya species by its pollinaria alone, could not see that the pollinarium he pictured on pages 7 and 8 of Fraterna 22, #4, is radically different from the pollinarium of the plant pictured on the cover of that issue. Left: This is, per Green & Kloppenburg from a flower of GPS-8844. I am almost 100% sure that this is not a pollinarium of the species pictured and featured as Hoya paulshirleyi. Right: This one in the drawing on the right was drawn from IPPS-8831. I found that in Blumea, vol. 46, #3 (2001), page 472. They don’t look like the same species to me. Per Kleijn and van Donkelaar both IPPS-8831 & 8844 are the same species. All GPS & IPPS numbers are the same. Left: The picture is one of my photomicroscopic pictures of a pollinarium taken from a flower of IPPS/GPS-8845. Right: This is the pollinarium sketch of IPPS-8845 that illustrated the Kleijn & van Donkelaar publication in Blumea 46, #3, on page 468. As noted, Kleijn & van Donkelaar thought this was Hoya camphorifolia. They were wrong. If Mr. Kloppenburg really wants to honor Paul Shirley with a hoya named for him, he’s lucky that this publication isn’t a name publication after all because if it had been validly published, with GPA-8844 cited as its Holotype, his error could not be corrected. Even an author cannot go back and change the Holotype on a validly published name. On these pages Mr. Kloppenburg named a species for the dead husband of widow, Cindy Krohn. She supplied the flowers. Kloppenburg said that her husband “obtained the plant.” He didn’t say where he obtained it, but Mrs. Krohn thought it was a Philippine native (or so DK reported). This is still another example of Kloppenburg’s “kissing up” to people who have never contributed anything to the understanding of the Hoya Genus, while ignoring people that have. I think it deplorable. Error: The word, Hoya is missing from the beginning of the very first sentence. 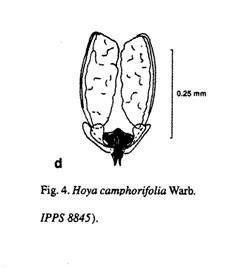 He called it Hoya krohniana and cited the holotype specimen as “70365” and noted it is housed at CAHUP. That is the College of Agriculture, University of the Philippines. He did not say whose “70365” this is. I assume that it must be a specimen made from the Krohn’s plant. I could be wrong. He went on and listed 10 specimens which he said were in the herbarium at Bogor, Indonesia but did not name the collectors of these specimens. He cited a specimen at US (the US National Herbarium, Smithsonian). That US specimen does not exist, unless it was deposited there yesterday. He cited one specimen which he said is housed at PRE (the Botanical Research Institute, National Herbarium, in Pretoria, South Africa), which is certainly not noted for its hoya collection.. Not a single one of his cited specimens were identified by the name of a collector. It is very likely that two or more collectors will have specimens of different species, bearing the same numbers. I consider this gross negligence. As for the hoya described and pictured on pages 9 through 12. There is not an ounce of doubt in my mind that it is Hoya lacunosa. It matches Blume’s 1849 drawing extremely well. I am also sure that it did not come from the Philippines. I have seen and examined the hoya collections in 9 major herbaria and never saw a specimen of Hoya lacunosa from the Philippines. I believe that the particular clone featured here, came from Thailand via Chanin Thorut, who sent it to me in the early 1990s. I distributed it far and wide. The foliage isn’t always dark and small as shown here either. David Liddle sent me a clone of Hoya lacunosa that also looks like this. He said that it came from Langkawi Island. That’s located in Northwestern Malaysia, near the Andaman Islands, off the coast of Peninsular Thailand. Kloppenburg made a lot of noise about the pedicels being longer than those of Hoya lacunosa. Friends, I have been studying these plants for at least 25 years longer than he has and I am prepared to prove, if need be, that hoya pedicels and peduncles vary considerably in length, even on the same plant. He also noted that the flowers were larger. All the measurements that this fellow claims to be critical to hoya identification are not at all critical. If you believe they are, I have a desert island, smack dab in the center of the Okefenokee I’d like to sell you! All parts of all the hoyas I have ever grown vary in size from plant to plant and also from umbel to umbel on the same plant. Citing measurements, when describing a species, is desirable but one should stress that exact measurements are not critical. There are several reasons for this variance --- nutrition, light level, temperature, humidity, age of the umbel and, possibly, the phase of the moon when a cutting is planted. Just joking, but I know people who’ll swear by it. It is my opinion that the plant featured here as Hoya krohniana is Hoya lacunosa Blume and that it is closer to Blume’s type than any others I’ve seen. I haven’t seen Blume’s type but I assume that the drawings he left us of this species match his type. This one, Kloppenburg gave the title of Hoya panayensis Kloppenburg & Siar. He cited as type McGregor #32378 and said it was housed at UC (University of CA, Berkeley). There was no McGregor # 32378 on the inventory list of UC Hoya specimens that Kloppenburg sent to me. Later on, I borrowed the UC Hoya collection and had it sent to me here, at Fernbank Science Center in Atlanta. There was no McGregor #32378 in the collection sent to me. If there had been one, I’m reasonably sure it would have been there because McGregor did his collecting ‘way back in the 1920s. But then, it is possible that the specimen had fallen between the cracks and was recently found when a major house cleaning of the herbarium was undertaken, however, after telling us that the holotype is housed at UC, he shows us a picture of the holotype specimen and says it is housed at BO (Bogor). I found it in the BO collection, when I had it here on loan. I also found this same number listed in E. D. Merrill’s Enumeration of Philippine Flowering Plants. The specimens listed in that publication were destroyed in WW2 when the Japanese occupied Manila. I did not find a duplicate at US, which has duplicates of most of the pre-WW2 Philippine specimens. 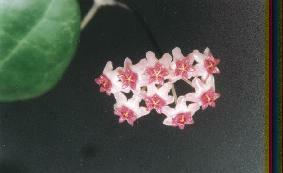 Mr. Kloppenburg claims that this species looks like his Hoya gigantangensis but with shorter leaves. Unless I was sold the wrong one labeled Hoya gigantangensis, there is no resemblance between these two. This publication is of a hoya found on a dried specimen sheet. The specimen pictured is remarkable in that the flowers on it are in living colour, as are the leaves. I have never seen a dried herbarium specimen that retained the flower and leaf colour for even a year. White flowers sometimes appear dirty yellow or brown but all the leaves I have seen are brown or tan except for a few darker leaf species. Those dry up black. A McGregor specimen would be at least 80 years old. McGregor died in 1936 but had ceased collecting in the Philippines 10 years earlier ((see Index Herbariorum, Regnum Vegetabile Vol. 93 , Part II (4) Collectors)). I saw that BO specimen. Its leaves were not green as those on the pictured mini-specimen are. Something just doesn’t look right about this to me, but maybe this is a first! Errors 1 & 2: Documentation of picture #4 says that this is the “inside top view of a flower” and that it is “bilobes.” 1). I am sure that he meant to say it is “bilobed,” but I can’t picture a bilobed hoya flower. 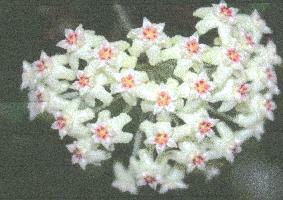 A hoya flower has a 5 lobed calyx; a five lobed corolla and a five lobed corona. Some coronas appear to be bilobed. 2).BUT his picture is not a picture of the top view of a flower. 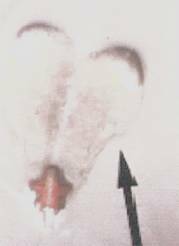 It is a picture of a single corona lobe and 3/4ths of a second lobe. Error 3: Documentation of picture #5 says that this is a “Photo of one coronal scale.” It is a picture of the inside top view of a single flower with the tips of four of its corolla lobes cropped off. The tip of the 5th corolla lobe is visible. Error 4: Documentation of picture # 6 says that this is a “Pollinarium.” It is a picture of a single pollinium and a retinaculum that may or may not be actually attached. Picture quality is too poor to tell for sure. To be a pollinarium, there’d have to be two pollinia. There is only one in the picture. 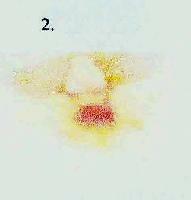 Error 5: Documentation of picture # 7 says it is a pollinium. It is only part of a pollinium --- looks like something chewed off a large chunk of the upper half. The bottom 2/3ds of page 15 is a greatly reduced scan of a herbarium specimen. It has been reduced to such a small size that it is impossible to read any of the notations on it. I’ve tried reading it with a hand held magnifying lens. I scanned it and tried to read it by zooming in on my computer. That only distorted the image. This copy is so greatly reduced and of such poor quality that it is anybody’s guess as to what it really is. Note that on page 13, he said this was a UC specimen. On page 15, he says this is a BO specimen. (BO is Bogor, Indonesia). He said it was misidentified as Hoya gracilis Schlechter “as a var.” This may or may not be true * but to be of any use to anyone, the picture should be large enough for people to read the documentation on the reproduced specimen. Wayman can tell us what it says but Ms. Wayman’s track record of printing “Hoya fiction” is too well known for anyone to trust what she says. I recall, for example, her publishing pictures of Hoya coronaria and Hoya rhodostele mislabeled as Hoya coriacea (See Fraterna 1st ¼ 1993, pages 8-13). Ms Wayman is noted for messing up other people’s publications by trying to explain to others what the authors really meant. How do we know if Ms. Wayman didn’t run in a specimen of Hoya rhodostele or Hoya davidcummingii and pictured it there? Both have similarly shaped leaves. It would follow a pattern she has practiced for nigh unto 25 years. * Kloppenburg described the corolla of this species as being “rotate, not revolute” and its inner surface as “pubescent.” Hoya gracilis Schltr. corolla lobes are rotate, not revolute, and its corolla lobes (inside) are pubescent all over (unlike other Acanthostemmas whose corolla tips are glabrous). From what I can see of the poorly reproduced pictures, I think it very likely that this is Hoya gracilis, just as E. D. Merrill cited it in his Enumeration of Philippine Flowering Plants. I’d want to see better pictures and some living material of a hoya from the type location before swearing that my theory is correct. Schlechter never got around to publishing var. philippinensis. I have seen Schlechter’s type of both Hoya gracilis and Hoya gracilis var. philippinensis. I’d like to see the McGregor specimen up close so I can read what is written on it. Was it really collected in the Philippines, or somewhere else? I’d also like to see some decent pictures of its flower parts, taken by someone with a better track record for correct labeling. Hoya fitchii Kloppenb. Type 20096 (UC). He didn’t say whose 20096 this is but he did say it was one made “ex hort., Kaaawa, HI.” That leads me to think that it is Ted Green’s 20096. If I am correct, he should have been given credit because it is possible that someone else could have a specimen numbered 20096. There needs to be a way of distinguishing between them. Error 1: Wayman didn’t believe me when I said this in a previous issue so I guess I must not only cite proof, I must waste space and illustrate it. She misspelled Charles Marden Fitch’s name, again (as Charles Marsden Fitch). Below you’ll find a picture of the title page of one of his books. 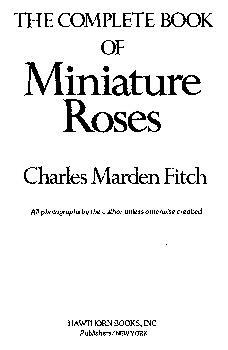 I can, if need be, make copies of a half dozen more of his books’ title pages, which show his name spelled exactly the same as it is spelled below. Errors 2, 3 & 4: In the first paragraph he said that this is similar to “Hoya cagayanensis (Schlechter ex Elmer) Burton” 1987. Fact 2: This species is NOT AT ALL similar to Hoya cagayanensis. Fact 3: The “ex Elmer” does not belong there. In correspondence with Dr. David Goyder, I mentioned that Kloppenburg and Wayman had written that sentence in earlier works. I told him that I thought it was not correct. He told me that I was correct. I told him, also, that the same sources had written that my publication was not valid. I asked his opinion. He told me that my publication IS VALID. Fact: Schlechter never saw this species and certainly did not make a drawing of it nor did he put it on a type sheet. I’m sure DK must have been referring to Schlechter’s drawing on the Hoya cagayanensis type sheet but that’s not what he said. I couldn’t figure out which of the two he said had “acute outer coronal lobes.” I think he meant CMF-8. Actually both are acute. On the other hand, his reference to one of them not being acute makes me wonder if he may have been thinking of Hoya macgregorii Schltr., as that is what he called CMF-8 for several years before he started calling it Hoya cagayanensis. 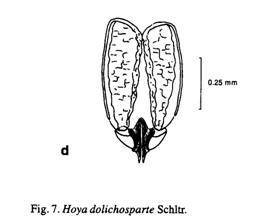 Schlechter’s drawing of Hoya macgregorii coronas are obcordate. Mr. Kloppenburg seems to have forgotten all the different things he has called this one. I believe that he has all of them mixed up in his nonagenarian brain. Prior to 1991: Following my flawed example, Hoya bordenii. 1991: Hoya macgregorii, in his book, Philippine (sic) Hoya Species on pages 62 & 63. Here he did not say this was CMF-8 but his illustrations are easily identified as this species, although a couple of the herbarium specimens he cited as being this species are actually Hoya obscura specimens. 1992, in his book, Hoya Handbook, he called it CMF-8. We know it is the same because of his picture. 1999, in his book, The World of Hoyas, he called it, for the first time I’m aware of, Hoya cagayanensis. 1999 through 2009, he continued calling it Hoya cagayanensis. 2010: He now says it is Hoya fitchii. I’ll buy that, but with reservations (*** down the page). Fact: It does no such thing! 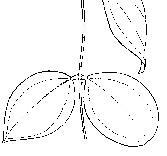 Schlechter’s drawing of the Hoya cagayanensis flower shows a corona lobe with fairly broad curving sides and with what looks like a tiny canoe lying on top of it. In the “canoe,” near the upper (inner) end there is a small umbo. That corona lobe is scooped out on top. It is deep enough to hold water. If it were keeled, that wee “canoe” would appear to be upside down. It is right side up and looks as if it only needs a couple of paddles and a body of water to carry wee little people for a canoe ride. So where does he get the idea that there is a keel down the middle of the corona scale? 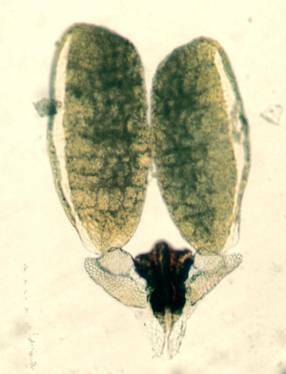 He is, I believe, back in the 1980s and he is comparing this to Hoya bordenii, the only species ever associated with CMF-8 that has a keel down the entire length of its corona scale. 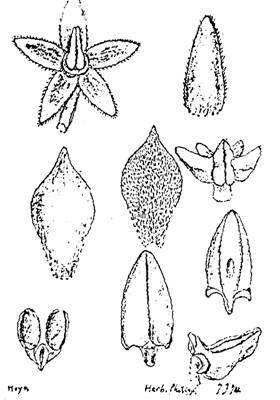 Above: Schlechter’s drawings of the Hoya cagayanensis flower parts. Fact: Hoya cagayanensis does not have triplinervation. It’s nerves are pinnate and so faint that one has to look closely for them or they can’t be seen..
Error 8: In the same sentence he said that Hoya bordenii has triplinervation. It does not. It has quintuplinerved venation. Some (not all), as shown here, have seven nerves, including the costa, all reaching nearly to the apex. Fig. 1 The two colourful. Leaves at the left are Hoya bordenii leaves, that have gotten a lot of sun. The smaller leaf is so much like CMF-8 leaves that, if I had not taken it off the plant myself, I might have thought it that species. It measures 6.5 cm. long by 2.1 cm. wide. The long leaf next to it is also Hoya bordenii. It measures 12.8 cm. long by 3 cm. wide. The veins are quintuplinerved, not triplinerved as DK said. Fig. 2: This is a Hoya benquetensis leaf. Its veins are quintuplinerved. This leaf is 12 cm. long by 4.5 cm. wide. Fig. 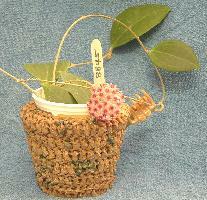 3: This leaf is a Hoya cagayanensis leaf. 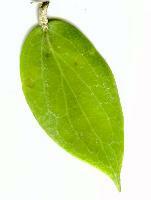 As you can see, its veins are practically invisible, in spite of the fact that the leaf is quite thin. It is 9.3 cm. long by 2.9 cm. wide. The nerves are pinnate. Fig. 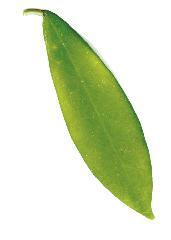 4: This is a CMF-8 leaf. Next he numbered each of eleven very pale pictures and told us what they are. It’s a good thing he told us because none of them look like what they are supposed to be. I assume that you have your copy handy to check the accuracy of my observations. I tried scanning them and putting them here, next to my own pictures but DK’s pictures were so pale and out of focus that I couldn’t get accurate reproductions. Picture #1: He said it is the side view of a pedicel, calyx and ovaries. Strange! I see only a part of a pedicel, with what looks like a pair of pouting lips on top, with a toothpick sticking out between the lips. I see no carpels (He calls them ovaries but, really now – animals have ovaries; plants have carpels). The only thing in the picture that is clear is the shadow of whatever it was that he photographed. 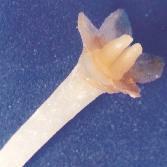 Picture #2: He said that this picture is the top view of a calyx. To me it looks like an early 20th century airplane ----- something like the first one Wilber and his brother flew at Kitty Hawk back in 1903, or the remains of the one in which Amelia Earhart disappeared into the Pacific. It could also pass for a new insect genus. It certainly doesn’t look like a calyx of anything! Left: Kloppenburg’s picture #2. He calls that a calyx and carpels. I wonder what a shrink would think of that? 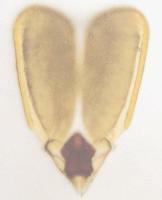 Right: My picture of a CMF-8 pedicel with its calyx and carpels on top. Although extremely sparse, there are a few cilia on the sepals. The thalamus is covered with what appears like tiny pimples or warts, as are the centers of the outer surfaces of the sepals. Picture #3: This is supposed to be a picture of the outside of a flower. It is rectangular in shape. No hoya flowers are rectangular in shape. The left half of the “whatever” in the picture is orange coloured and looks sort of like the mouth of a gold fish. The rest of the picture looks like a white baby diaper. Picture #4: This is supposed to be a picture of the outer surface of a corolla. It is a partial corolla. Only one lobe is complete. The other four have varying amounts of their lengths chopped off. Picture #5: This is supposed to be a picture of the inner surface of a corolla. It is a partial picture. There are two complete lobes and two partial lobes. The fifth lobe is entirely missing. Pictures #6 & # 7: These are supposed to be upper and lower surfaces of a corona. #6 has only a single lobe visible and the picture is so small and out of focus that you can’t see the longitudinal channel that is supposed to be there. #7 is supposed to be the upper surface picture of a corona. It shows only 2 lobes. No detail is visible so it, like the other, is useless. Left: My picture of a CMF-8 corona, upper surface. The blue colour is from vegetable dye, which both George and I soaked flowers in to make the shapes of the various parts show more clearly in pictures. None of the lobes are keeled. All have a higher area occupying about a third of their upper length and a little raised area right at the outer tips but the center of the lobes are concave. DK said the upper surface of the corona lobes were “keeled, their entire length.” I don’t see any keels, do you? Right: The lower surface of a CMF-8 corona. Note the longitudinal sulcation on each lobe. Error 6: Kloppenburg said the corona lobes were diagonally sulcate on the bottom. Fact: All hoya corona lobes (except Acanthostemmas) are longitudinally sulcate. Error 7: In his description of the upper surface of the corona (Picture #7), he described the corona lobes as being “somewhat blunt on outer apex.” Elsewhere he said they were acute. Fact: As lousy as his pictures are, one can still see that the outer apexes of the corona lobes in his pictures are NOT in the least bit blunt. Picture #8: This is supposed to be the inside view of a flower. Only two corolla lobes are visible and only 1 and ½ corona lobes are visible. That doesn’t add up to a flower, in my very biased opinion! Picture #9: This is supposed to be a corona lobe, side view. It doesn’t look like any I’ve ever seen on this species. This one looks like the whole gold fish. That gold fish looks like it had lip augmentation, as so many young women, with more money than brains, have done these days. They look like they’re ready to gobble up, in one bite a human twice the size of that whale in Jaws. Error 8: He said, “Picture not very clear shows a raised inner lobe with dorsal surface nearly horizontal, outer apex rounded.” He’s right. His picture is not very clear. That just about the only true statement in the entire issue. Fact: When a single corona lobe is removed from the other four lobes, it loses the support they provide, so the lobe topples over towards its outer end, causing the inner apex rise up. This is not the natural position. The inner apex of this species, when in its natural position is lower than the outer apex. See picture below. Above: My picture of a CMF-8 corona as mother nature grew it. Note that the inner apex (that he calls the inner lobe) is not raised, but the outer apex is. The outer apex is not rounded, nor is it “blunt.” That food colour, on most of the flowers we photographed, left each flower part a different shade of blue, making outlines easily seen. It didn’t work for this one. Picture #10: This is said to be a single corona lobe, showing the “dorsal slightly concaved surface.” Didn’t he say, further up the page that the dorsal surface was keeled? Of course, we know it isn’t but he did say that! Fact: The anther does not exceed it. It is the “anther appendage” that exceeds it. Picture #11: He said that this is a pollinarium. I agree. It is a pollinarium. Error: The pollinarium pictured is not a CMF-8 pollinarium. 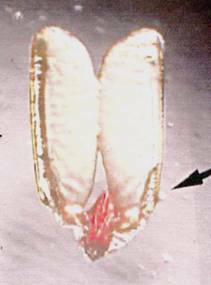 I base this on the longer in ratio to width of the pollinia and the completely rounded upper tips. As lousy as his picture is, I think you can see that the pollinium on the right in his picture isn’t all there. Friends, this publication was not based on a hundred year old dried herbarium specimen. Fresh flowers were available for photographing. Kloppenburg owns some of the most modern and expensive microscopes and cameras available. There is no excuse for the lousy pictures in this bulletin. I suggest that his wife (if he still has one) take him to the mall and leave him to find his own way home. I doubt he can, so when the police find him wandering around, aimlessly that she should have him committed to a full care facility because he don’t have a full sack of marbles! *** I gave my plants away back in the mid-1990s because I was too sick to care for them. Since starting to build my collection of hoyas again, I haven’t had blooms on my new start of CMF-8 so I can’t verify what David Liddle told me about this one. I don’t recall his exact words but he said he thought that DK may have been right when he, at first, decided that this is Hoya macgregorii. He suggested that I dry some flowers of it and if I did he thought that the corona lobe’s outer apex might turn up and leave its tips bent toward the center and, when viewed from above, appear heart shaped due to the sulcation tip’s showing, making the outer, upper tip appear cordate, as Schlechter drew the corona lobes on the Hoya macgregorii type specimen. His argument in favor of that name, sounds reasonable to me but I’m not 100% convinced. When I get flowers on CMF-8 again, I will do as David suggested. I hope he is right because, much as I’d like to see my fellow Garden Writer associate, Charles Marden Fitch, honored, I’d much rather “sink” anything Kloppenburg publishes. Yeah, I know, I’m one mean ________ (I leave that blank for you to fill in). PAGES 21, 22 & 23. I am unfamiliar with this specimen, which Kloppenburg has named Hoya savaiiensis. It looks familiar but I’d have to search through several hundred pictures looking for something that looks like that --- and then, I might learn that it is “only something similar.” I think I’ll recognize it if I come across it. If I do, I’ll let you know. Error 1: THIS IS NOT A VALID PUBLICATION AND IT NEVER WILL BE. ** It is Hoya intermedia A. C. Smith. Just because Smith was mistaken in sinking it into Hoya carnosa (if he was), doesn’t invalidate the name Hoya intermedia Smith. I’m more inclined to believe Smith than Kloppenburg but I do admit that it looks more like Hoya publicalyx than Hoya carnosa. Error 2: The Type sheet, which is at US IS NOT #309. It is A. C. Smith’s #399. Holotypes and Isotypes always have the same specimen number. So, I was right. This species is, and will forever be, Hoya intermedia A. C. Smith, unless or until someone sinks it into a species that was published earlier than A. C. Smith’s original publication! These four pages are devoted to Ted Green’s 8 favorite hoyas. I think it very odd that a man who has written copiously that all Eriostemma Section hoyas belong to a GENUS named Eriostemma, would call 3 of them his “favorite hoyas.” I’m glad, if that means he is conceding that they truly are hoyas. Error 1: He, as always, calls the second pictured favorite, “Hoya archboldiana ‘Y M Excellent.’ ” That is the way the Code for Cultivated Plants dictates that cultivar names be written. This plant is NOT a cultivar. It is the only hoya I have seen that exactly matches Norman’s holotype specimen of Hoya archboldiana It does not need and should NOT be saddled with the “Y. M. Excellent” on its tail end. The Y. M. stands for York Meredith, the Australian dealer who sold it to him. Error 2: The picture labeled Hoya sp. Gold Star should be labeled Hoya cv. Gold Star. That is because it is a cultivar. It is a selected seedling grown by the late Genevieve McDonald of Merritts Island, FL. I have a letter somewhere in my unfiled collection of papers, from Ms. McDonald, attesting to that fact. She is also the source of all the “One” cultivars, i. e., Little One, Cream One, Pretty One, Sweet One and also of Red Buttons. The seeds of all of these, including Gold Star, were from “bee pods” on her own plants. She grew all of them outdoors and had no idea which hoyas supplied the pollinia. These are advertising pages and the same I’ve said about them in every previous issue of PS-TheHoyan, still applies. This page has three very attractive pictures of Kleijn & van Donkelaar’s IPPS-8845. These pictures are labeled Hoya paulshirleyi T. Green & D. Kloppenburg. Error: Until a species is validly published, the name you call it doesn’t exist. As of February 15, 2010, this is not validly published. There is no Hoya paulshirleyi. Distal: The region of an organ that is furthest from the point of attachment. Dorsal: Of, toward, in, or near the back or upper surface of an organ, a part, or back of am organ. Epilithic: Growing on or attached to the surfaces of rocks or stones. Epiphloeodal: growing on or attached to the surface of tree bark. Example: Hoya imbricata. Nonagenarian: A person who is between 90 and 100 years of age. A corona, it means that the corona sits directly on top of the corolla instead of on a raised column. Strict: Straight, narrow and upright. Sulcate: Having narrow, deep furrows or grooves. Sulcus: A deep narrow furrow or groove.